From prized steak and protein production to meat quality and proper nutrition, beef industry members will have a tall order of topics to choose from at GLIMPSE 2020: the 29th Annual Alltech International Symposium in Lexington, Ky., USA, from May 19-22. New in 2013, Alltech International Symposium delegates will have the opportunity to select breakout session tracks. These tracks, as opposed to traditional species or subject breakouts, will offer attendees a more holistic experience in which they take part in discussions ranging from algae and agriculture's carbon footprint to nutrition and marketing. "This year delegates will be able to select from a range of topics affecting beef production from cow/calf and feedlot management to processing and consumer demand," said Aidan Connolly, vice president of Alltech. "The 2013 program is designed to stimulate an open dialogue and generate new ideas for the future of the beef industry." • Protein Production: What Can We Do to Enhance the Consumer Experience? Other topics that may be of interest for beef industry members attending this year's Symposium are crisis management, nutrigenomics, algae, mycotoxins, fertility, antibiotic free and marketing. In these sessions, participants will have the opportunity to explore examples such as successful antibiotic-free programs from Russia, the United Kingdom, Italy and the United States, as well as ideas on how to nutritionally keep pace with genetics. This year's Symposium will aim to answer questions such as: Why do we cull cows so early? Why is there such high infertility coming into the herd? Why don't we have greater feed efficiency from beef finishers? Do we understand new technologies and how to apply them? Registration for Alltech's 29th Annual International Symposium is open now and available for an early discount price of $599 until April 15 at 11:59 p.m. EST. Standard registration after April 15 will be $850. Two paid registrations from a single company or organization will receive a third registration free of charge. Delegates who are members of ARPAS and AAVSB can also earn CEUs. 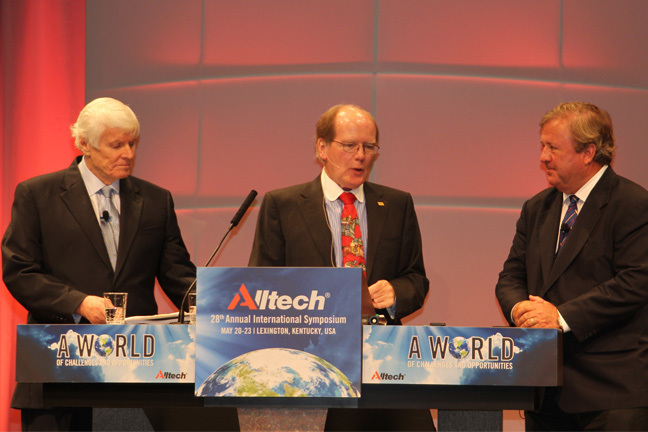 For more information, or to request an invitation, contact a local Alltech representative, click here for information about the 2013 Symposium.